Happy Sunday! I'm currently sitting at a Starbucks bundled up in chunky cable knits, a pashmina and sipping on my pumpkin spice latte - quite fitting seeing today is the first official day of autumn! With a change in seasons, this is the perfect time to do a little blog rebranding and give the layout a facelift. Over the next few months, I would love to focus on making this a true life and style blog, hence the name change to The Standard Chic. What is the meaning behind it? I believe that no matter what you do, it is more fun to do it in style - don't be afraid to add a little glam to your everyday routine and embrace the 'everyday special'. Whether it be choosing what outfit to wear, to deciding on a new food to try, to some home TLC, life is short so live everyday fabulously! Sweater: Joe Fresh. Leggings: Mendocino. 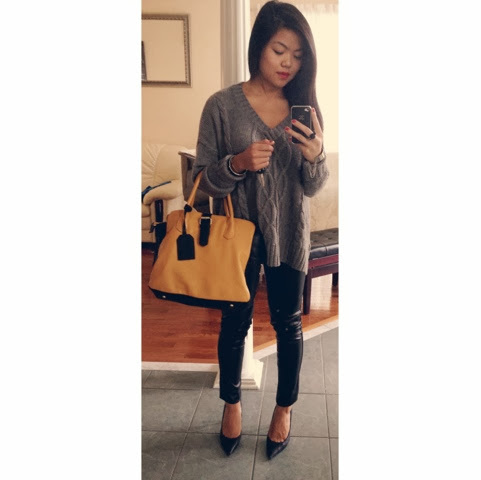 Shoes: Sam Edelman. 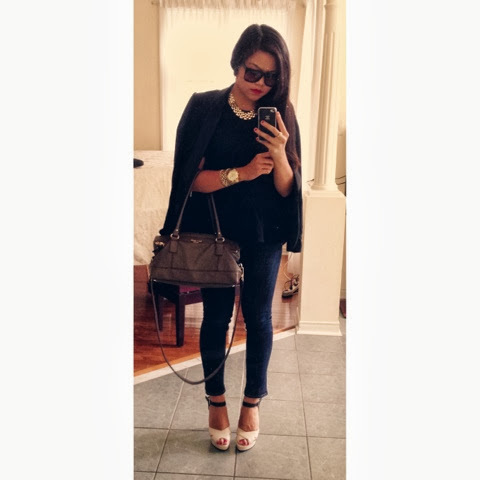 Blazer: Zara. 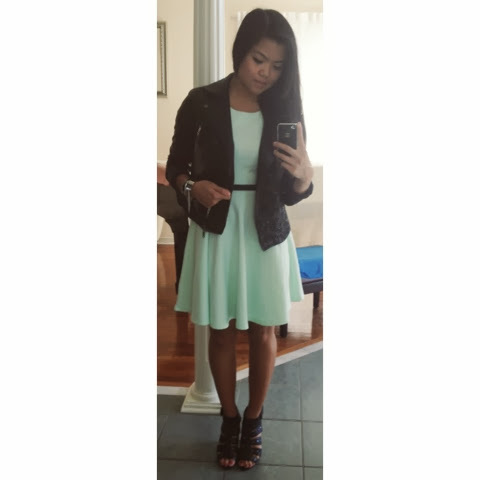 Peplum: H&M. Jeans: Rag & Bone. Bag: Kate Spade. Shoes: F21. Chambray top: Roots. Tank: Gap. 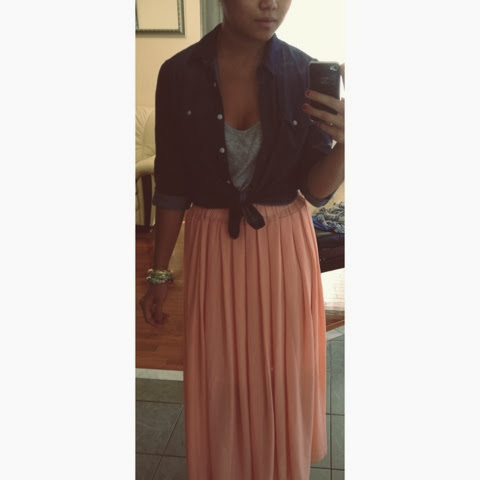 Maxi skirt and bracelets: HK/Shanghai. Dress, belt and jewellery: H&M. Shoes: Aldo. Lastly, this is one of my favourite finds of the week! How fun is this necklace from Vero Moda? I've been addicted to statement necklaces lately and couldn't pass up on this one! Hey Minh! Nice to meet you. : ) I'm your newest follower and hope to chat with you more soon! 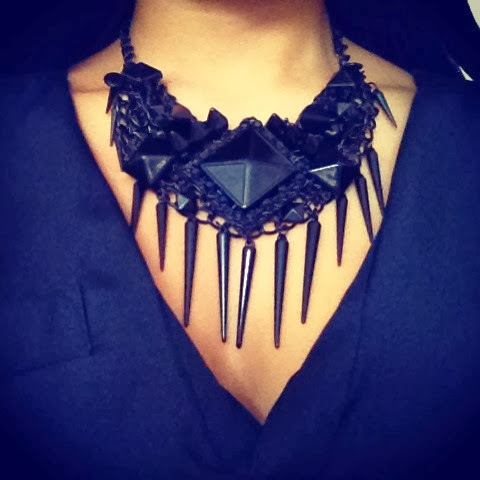 That Vera Moda necklace is quite the piece! Absolutely love your blog layout!! Soo chic!!! I love (!!!) this new layout! I like that necklace. It's so usual. You rarely see bib type necklaces anywhere so it's not always easy to get the color and pattern that is needed. Plus, sometimes people don't have as many ideas on how to wear a necklace that is designed in that way since they see so few examples.